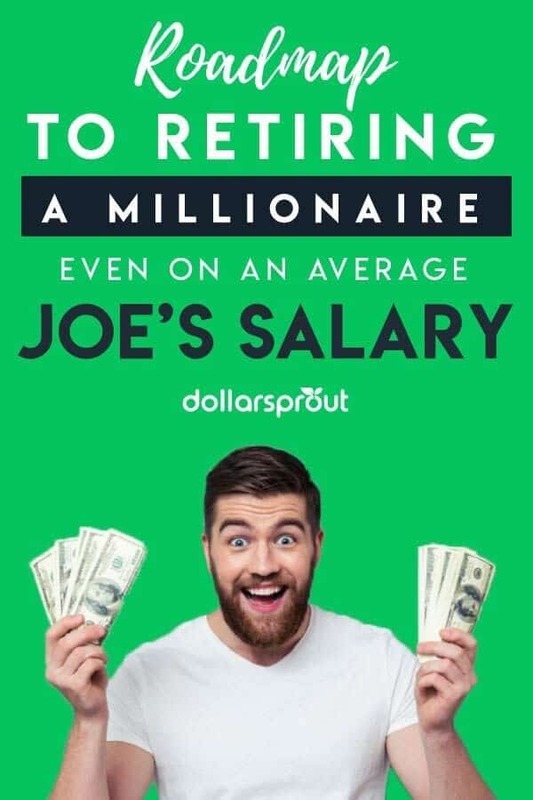 This is a guest post on how to retire a millionaire by Joe from Average Joe Finance, a website dedicated to providing actionable advice in the areas of personal finance and entrepreneurship. Imagine what it would be like to have one million dollars in retirement savings. Most of us have daydreamed of having that much money one day, but consider it just that – a dream. Why is that? Why do we so quickly dismiss our ability to become a millionaire? For me, there was always this voice in the back of my head saying, You? A millionaire? HAH! That’ll never happen. Before I started taking my finances seriously, I felt like I was doomed to work my entire life and hope I had enough to retire at 67. Then, I learned about the Million Dollar Roadmap and everything changed. It’s easy to come up with reasons why you’ll never be a millionaire. Maybe you think you don’t earn enough or that you’re not a good investor. However, neither of these has to prevent you from becoming a millionaire. If you invest consistently, all that’s really holding you back from retiring with seven figures is time. When I first realized I could accumulate a million dollars by saving less than 10% of my income, I was shocked. But it’s true. And the process is simple enough that you don’t need to be a finance guru to follow it. You don’t have to be a genius or a celebrity or win the lottery to become a millionaire. All it takes is a little dedication and following one simple formula to create your retirement savings plan. I’ll break down each portion of the equation individually, but for now, let’s look at the formula overall. Anyone who understands basic multiplication can see how a change to one input impacts the overall equation. If you want to reduce the amount of time it takes to become a millionaire, then you’ll need to increase your return on investment (ROI) or savings. Maybe you have credit card debt and/or student loans and can’t save as much. In that case, you’ll need to increase the amount of time you save or your investment returns. Or you can look for ways to increase your income. Everyone’s retirement savings plan is different, and that’s okay, as long as the result is the same. The first step on your roadmap? Start as early as possible. Let’s say you start investing before you even graduate college. Using the chart below, you would have to save approximately $2,200 a year to have a million dollars at age 67. Maybe you are more like the average worker and wait until you’re 30 to really start focusing on your retirement savings. It’s still possible to retire a millionaire, but you would need to save over twice as much per year. Now you may be thinking, “it’s twice as much, but 10 fewer years of saving.” Even factoring in those extra 10 years of saving, you’ll still come out around $80,000 less overall. The other advantage of starting early is that it makes the savings target much more obtainable. If you look at it on a daily basis, it’s only around $6 per day. The reason time is so important is due to the power of compound interest. Compounding is when you earn a return on your previous gains. A simple example is earning interest in a bank account. Imagine you saved $1,000 and after a year earned $10 in interest. In the second year, you would earn interest on your original $1,000 plus on the $10 in interest that you already earned. Being able to make money on your previous returns may be the number one way to accelerate your journey to becoming a millionaire. Going back to the chart above, if your returns weren’t compounded (meaning you only earned interest on the money you invested and not on previous earnings) and you started at age 20, after 47 years you would only have $303,000. That’s almost $700,000 less than when your returns are compounded! Luckily earning compounded returns isn’t very difficult (more on that later). Most people think you need to earn a ton of money to become a millionaire, and for a while, I thought that, too. However, that idea is a fallacy. Even if you earn an average salary, if you’re smart with your money, you can pretty easily retire a millionaire. According to the Bureau of Labor Statistics, the average 20 to 24-year-old earns $525 weekly or $27,300 annually. Starting at 20 means you would only have to save a little over 8 percent of your salary a year. Individuals aged 25 to 34 years old make an average of $776 weekly or $40,352 annually. Again, this works out to saving a little over 8 percent if you start at 25 or a little over 12 percent at 30. If you’re just out of college and living at home (no shame in your money saving game!) then saving 8% of your income into a retirement savings account may not be a problem. But maybe you’re on your own and have student loans to pay, which makes reaching that annual target more challenging. If that’s the case, there are a few ways to boost your savings rate. One way to increase your into your retirement savings account balance is to earn some extra cash. You could try earning some extra money online in your spare time, or even start a blog or other online business. You could also improve your skills on sites like Udemy to get a raise at work or start a side hustle. Or try to reach the annual savings goal in three weeks with the 21 Days to $2,100 Challenge. Another way to hit your savings target is to take advantage of free money from your employer. If your job offers a 401(k), chances are it offers a company match. Essentially for every dollar you put in, your employer will also contribute a certain percentage (typically 50% up to a certain threshold). Taking advantage of a company match is an easy way to jumpstart your journey to a million dollars. My company matches 50% of my contributions up to 6%. That means if I contribute 6% of my income to my 401(k), the company I work for puts in another 3%. That boosts my total savings to 9%! Let’s say I need to save $3,300 a year to become a millionaire when I retire. Assuming it’s not more than 6% of my salary, I would only need to save $2,200 per year. The 50% match from my company would make up the $1,100 difference. 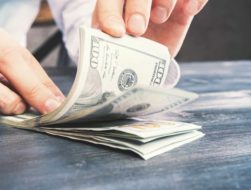 While saving a few thousand dollars a year may seem like a lot, if you take advantage of free money from your employer or earn some extra money online, it’s entirely possible to become a millionaire even on an average salary. The final leg of your journey to retiring a millionaire is investing your savings. In the example above, you will need to earn an 8 percent return each year. While this may seem high, by choosing the correct investments you should be able to easily reach that benchmark. Trying to pick individual stocks is not the best way to invest if you’re looking for consistent returns. I’ve had some success with picking individual stocks in the past, but it’s not wise to rely on this method alone if you want to retire a millionaire. Instead of trying to pick winning stocks, I’m a proponent of buying a low-cost index fund that mirrors the S&P 500. Over the past 90 years, the S&P 500 has had an average return of 9.8 percent, well above the 8 percent threshold you need. Plus, this is a compounded return, which means your money will grow even faster. Also, by selecting a low-cost fund, more profits go back to your account instead of the fund manager’s pocket. Now you know the truth behind what it takes to retire a millionaire. It’s something that’s attainable for most people. If you have enough time and are able to consistently save, the only thing standing in your way of a million dollar retirement savings is you. Average Joe Finance is a personal finance and investing community devoted to teaching the rules of finance for today's modern world in order to help others take control of their money and build lasting wealth. You got this Joe, it doesn’t take a Wall Street salary, as you show the math works for normal people. In fact regular people that take care of business are going to have more for retirement than a lot of brain surgeons who are spending every penny they make plus some. Steveark, exactly! People think that only Doctors or Investment Bankers can retire wealthy, but there is so much more to becoming wealthy than a six-figure salary. You’re right that often times, the highest earners are the highest spenders and when the income dries up, they are often left with a huge amount of debt. Slow and steady really does win the race. Becoming rich is available to anyone, regardless of their upbringing or education level. Here are some realistic strategies to get rich without winning the lottery or inheriting a large sum of money.